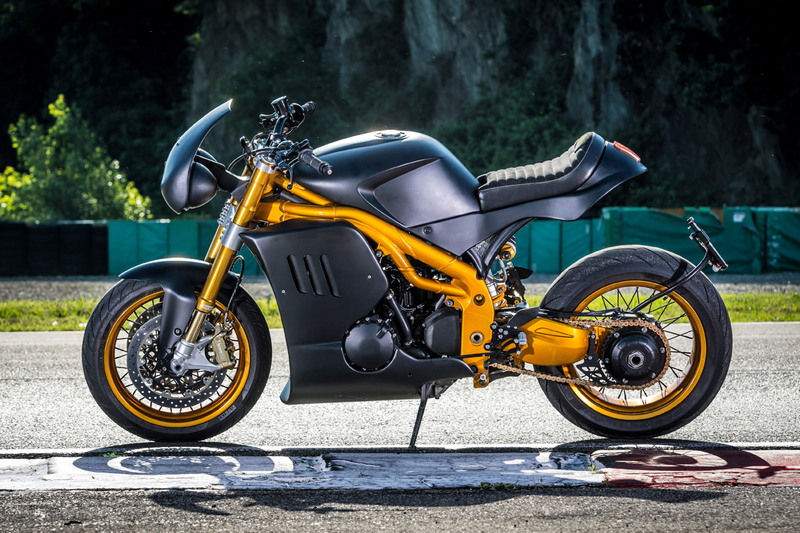 the Tripla Competizione built by Italian Dream Motorcycle. It is part of a series of three models of motorcycles and the first project of Tripla Collection, for which they were inspired by the visionary Carlo Talamo, who greatly influenced their work. Carlo Talamo was the revolutionary industrialist in Italy. He with his team made various custom Triumph Specials like Baby Speed, The Speed S and Tiger Triumph. His design were so futuristic that they were taken by triumph for the factory production. One of the known work is the development of Speed Triple. 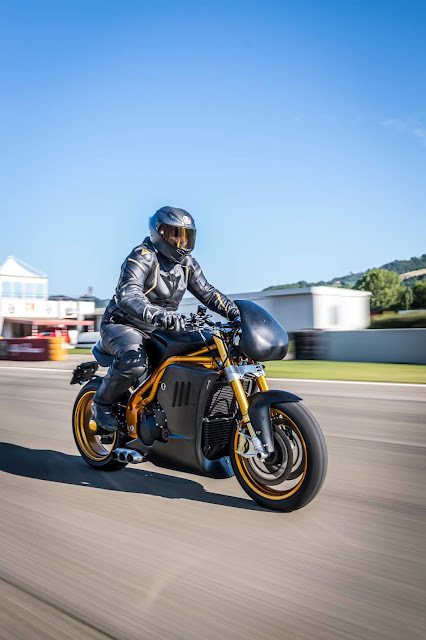 The Speed Triple 1050 was the first bike in the Speed Triple series to have a dedicated chassis, it is not a coincidence that they wanted to choose this starting point to work on. The Tripla Competizione series is based on the already powerful Triumph Speed Triple 1050, putting out 130HP out of the factory. They put an incredible amount of work to improve the performance of the engine and raised the power output to 145HP. Their work began by picking the highest quality components, most of which are used in racing circuits. These parts have been manufactured exclusively for IDM by the world's leading specialists. The bike follows the aggressive design of the futuristic Tripla series. Obviously the shapes have grown in proportion to the two apparently similar m very different Street and Speed Triple. the appearance is almost identical if not for two particularities the designs of the paintings change vents in the carriers, and the bike is always black but with many details anodized or painted in a special way in gold. Being track focused, the Tripla Competizione received an extensive amount of performance upgrades to maximize its potential. The bike was fitted with Pirelli Diablo Corsa paired to super sport discs that can handle up to 1,3G braking. Both front and rear suspensions are by Öhlins connected to new-gen radial forks. 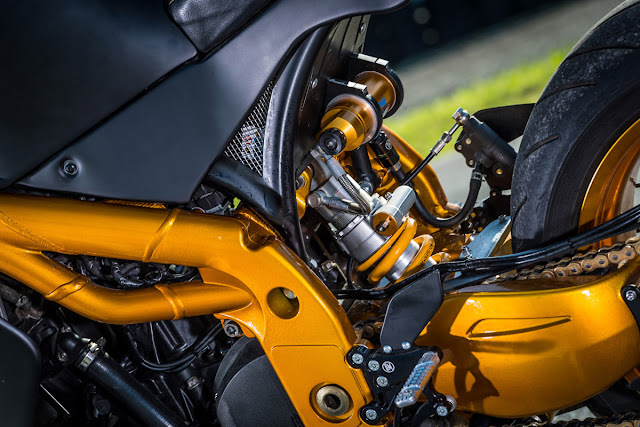 The mono suspension system offers extensive customization options that can optimize the bike to every kind of track. This will be particularly useful for riders who want to perfect their riding in every lap. 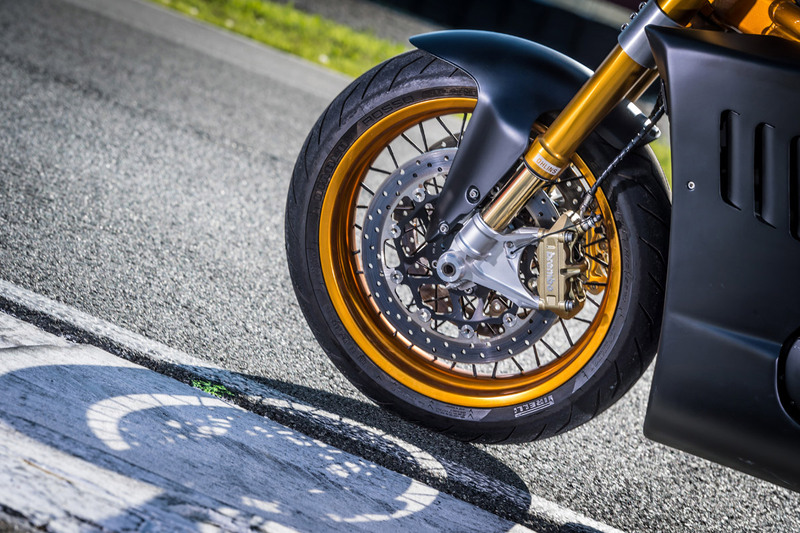 Braking is obviously handled by Brembo gold series with 4 pistons. The bars and knobs are by Accossato Racing who did a custom pushbutton for different controls. Motogadget provided the starting system that uses a proximity sensor for initiation. Despite performance being a priority, the Tripla Competizione received the perfect cosmetic treatment; a stealthy aggressive look. The dashboard has been cleaned up and upgraded with a multifunctional digital instrument by Motogadget. It sits comfortably atop The handmade aluminium fairings expose the special frame, a colorful characteristic of the Tripla Competizione. Speaking of the frame, it was bathed multiple times and coated with a special paint to obtain its color. 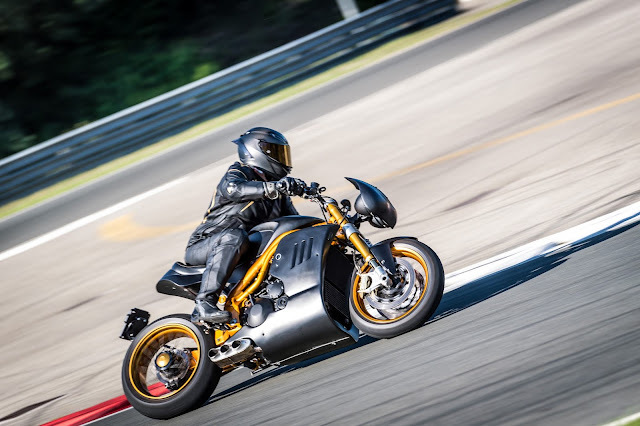 The bike ones with two different front fairings, a fully black one that serves as a track plate number; or a fully black fiber fairing that exposes the two crazy eyes, as Carlo Talamo used to call them. The seat is covered in leather and premium Alcantara.